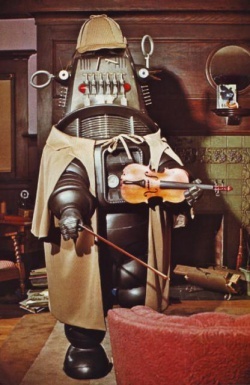 Holmes and Walston is an unaired TV pilot shot in 1975 by american director Bill Malone, produced by Don Post Studios, starring Robert Short as the voice of Robby the Robot and Jerry Mathers as Darrel Walston. Robby the robot was programmed to think it was Sherlock Holmes, and Jerry Mathers (as Darrel Walston) was the robot's caretaker. The robot is convinced that Walston is Dr. Watson, and in the first (and only) episode they set out to track and together they set out to track down an alien (whose robot is played by a Gort look-alike) who has come to Earth to steal power. Reference: Starlog No. 7, august 1977. This page was last edited on 15 July 2016, at 11:13.